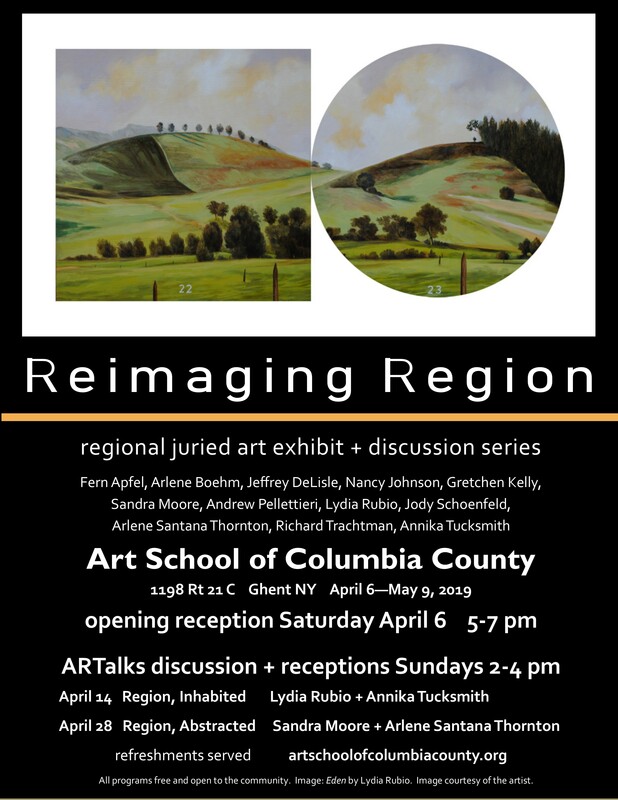 Join us for the opening reception for the exhibit “Reimagining Region” exploring region through the work of 12 artists exploring nature, environmental changes and threats, history, landscape, sites and structures. Together, they examine the place we call (or visit) as home. Featuring the art of: Fern Apfel, Arlene Boehm, Jeffrey DeLisle, Nancy Johnson, Gretchen Kelly, Sandra Moore, Andrew Pellettieri, Lydia Rubio, Jody Schoenfeld, Arlene Santana Thornton, Richard Trachtman, Annika Tucksmith. The juror was Kate Menconeri, Curator of Thomas Cole National Historic Site in Catskill NY. In celebration of Slow Art Day, an international museum program to encourage deeper engagement with art: interactive guided tour from 2-3 pm, and discussion with optional art-making from 3-4 pm. All supplies included and the program is free. Upcoming ARTalks are Sunday afternoons at the Art School from 2-4 pm. Each ARTalk features two artists from our region exploring a given theme in a guided panel discussion to accompany the exhibit. Free and open to the public, refreshments served.